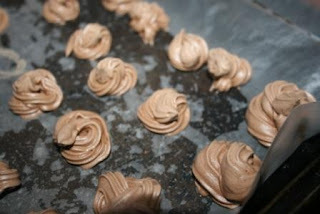 Two Bears Farm and the Three Cubs: When You're Counting Calories and Need Something Sweet - Chocolate Meringues! When You're Counting Calories and Need Something Sweet - Chocolate Meringues! 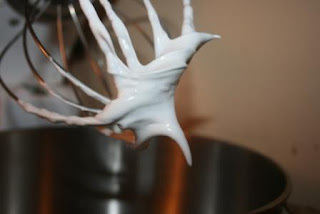 Meringues are easy to make, once you have an understanding of what it takes to beat those egg whites into fluffation. They're great because they are about 10 calories a piece, and you can make different flavors. 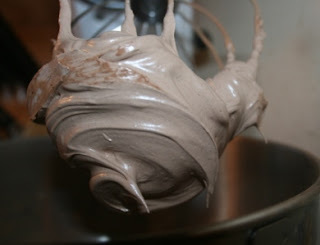 This particular recipe is for chocolate meringues. I use an old cake decorator from the 50s that my Granny Anne gave me. 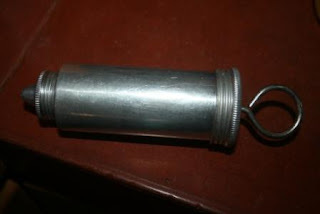 But you could use a piping bag or you could even just drop onto a cookie sheet with a spoon. Place on waxed cookie sheets. Bake in preheated 225* oven until firm, about 1 hour. Turn off oven but don't open it!! Let cookies stand in oven with door closed until cool, dry, and crisp, at least 1 hour. Makes 4-5 dozen meringues. These look amazing. The recipe makes so many meringues. What are you going to do with all of them? This is a great idea for us dieters! I imagine the varieties you can make are endless. GURL!...you know how I love chocolate, this looks just too incrdible!..I could eat every one of these. And thanks for visiting LazyonLoblolly, and yes you would enjoy "OUTDOOR WEDNESDAY",I'm excited that you are. YUM!!! I am going to be printing this one!!! sounds easy enough and looks delish!!! These look like little pieces of heaven! YUM! Ok...I'm gonna right it down. It can't be HORRIBLE for you unless you consume them all...in one sitting, right? Thanks for your comment on Mamarazzi's page today! Those look delicious! I'm going to try this recipe sometime. Thank you for entering my giveaway and inviting me over. I love the recipe section. I'm always looking for new recipes!